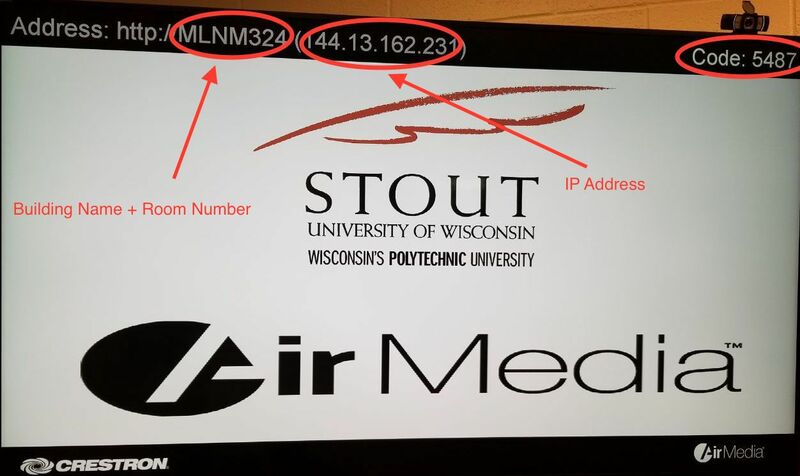 To connect, enter the host name (Building Abbreviation + Room Number) or IP address (No parentheses) displayed on the AirMedia TV on the left hand side. Click on Connect. NOTE: If you are on "Stout Guest" WiFi, you will only be able to use the IP address. For example, to connect to Millennium Hall 324 you could enter either of the following. Enter the code displayed on the upper right side of the AirMedia device. Once entered, click OK. When connected, this screen should appear. The Stop Button will prevent your computer from casting until you hit Start. The Pause button will freeze your computer display so that what is on the display will stay there until you click Resume. The volume control will control your audio volume and can also mute and unmute the audio. 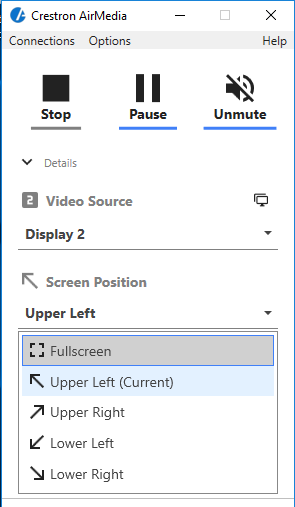 If you click the drop down arrow next to Details you can see more information and will have the option to change the video source from your primary and secondary screens. In addition, you can cast your screen into a quad.